The Michael Kors Access Grayson marks the luxury fashion brand's second shot at Android Wear, but the game has changed. Last year's Bradshaw and Dylan watches just missed the mark, as we argued that the tech and aesthetics were out of sync, but they still stood out in a sea of ugly smartwatches. Now the bar is even higher, with a gamut of fashion-forward Android Wear watches taking advantage of the more polished Android Wear 2.0. The new Grayson isn't alone. It's joined by the almost identical, female-targeted Access Sofie, giving Michael Kors the freedom to design the Grayson entirely with men in mind. It's also $350, the same price as last year's duo, making it one of the Android Wear gang's more expensive members. That shouldn't be surprising to anyone familiar with Michael Kors' luxury brand, of course. 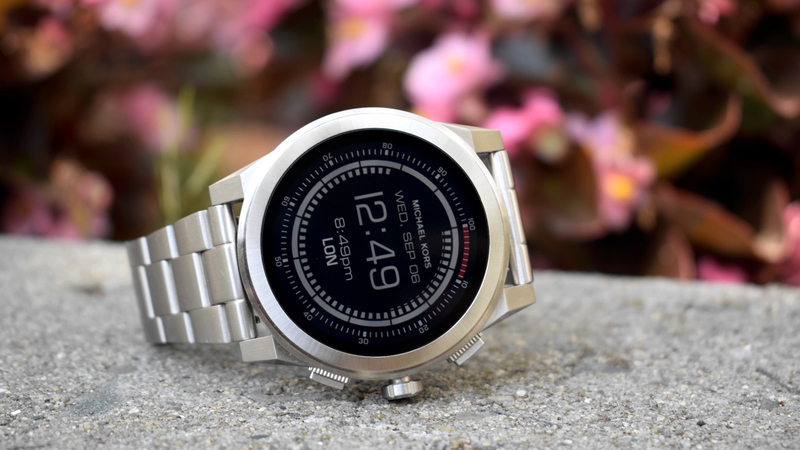 We've been spending some time with the Grayson to get a feel for whether the design changes are an improvement, how much better the experience is with Android Wear 2.0, and whether Michael Kors has delivered a smartwatch that better balances looks with smarts. Michael Kors has been making watches for far longer than the tech giants, and the Grayson is more fashion-conscious than anything from Apple or Samsung right now. It isn't, however, a subtle watch; having a female alternative means the Grayson can be unashamedly large, and at 47mm along with some chunky lugs, it's not modest. Slightly bigger than last year's Dylan, too. Even a colleague who's reviewed a few of the chunkier Fossil watches remarked that the Grayson felt noticeably large. But it feels purposefully big in the way a large "dumb" watch might, not, as in the case of the LG Watch Sport, because it's bloated by tech. Still, there's no denying that the Grayson wants to stand out, and fans of a more "dressy" or bigger watches will probably find it a better fit than those who like to keep their wristwear understated. The Grayson comes in a choice of stainless steel, gold-tone and blue/black ion-plate. One of the most immediately noticeable improvements is that the flat tyre, a blemish on last year's Dylan, is gone, with a nice 1.39-inch, 454 x 454 pixel AMOLED display. That's a bump-up on last year's 320 x 290 resolution and it shows, though we found the screen tended to fade under strong sunlight even when notched up to the highest brightness setting. Along the right side of the case you've got two buttons – three including the pressable crown – both of which can be used as shortcuts to your go-to features. We want to really highlight that rotating crown, not just because it makes scrolling through menus and notifications a breeze, but because very few other smartwatches are taking advantage of this Android Wear 2.0 feature right now. On the Grayson, which has an especially nasty habit of picking up smudges and fingerprints, the crown has been good at keeping my fingers away from the screen. Like the Movado Connect, Louis Vuitton Tambour Horizon and Tag Heuer Modular Connected 45, the Grayson is targeting the luxury market. That means any of you hoping to find much in the way of fitness abilities will be sorely disappointed. We've seen a lot of people criticise watches like this for lacking a heart rate monitor or GPS, but unless you're someone who runs with their expensive stainless steel watch on the regular, we don't see it as a problem. The IP67 water resistance means it's not fit for swimming either, though, which might be more irksome for some. However the lack of NFC, and therefore Android Pay, is a definite black mark. We've debated over whether Google should make NFC a minimum standard across Android Wear, and we do see both sides of the argument. But with a watch like this, it feels like a big missed opportunity in lieu of fitness elements – especially with the extra shortcut button. The lack of LTE will be viewed as bad or meh depending on your use case – some people we've÷ spoken to really can't go back to living without a cellular connection, while others still think the idea is absurd. Michael Kors has added its own twist to the software with its micro app, which lets you customise the watch faces. There are three modes here: 'My Looks', 'My Modes' and 'My Social'. The first lets you scroll through the different faces, which are categorised by vague colour themes, while 'My Modes' lets you set two different faces to come on at different times. Something serious or sporty for the day, perhaps, and a more colourful option to show off your fun side when the clock hits 6pm. With 'My Social' you can link your Instagram and Facebook accounts to use your own photos as faces instead, which gives the Grayson a nice added touch of personality – and a way to finally put those sunset 'grams to use. While we're on it, we've also enjoyed the Kors face that glimmers as you move your wrist, imitating light reflecting off a steel surface. Nice touch, MK. But beyond that, it's pretty vanilla Android Wear and its standard set of apps. Android Wear 2.0 runs perfectly fast on the Grayson and we've had no reason to complain, with the Snapdragon Wear 2100 chip keeping the Grayson at the peak of the game right now. Google's wearable OS is more stable than it was when we first tried it with the LG Watch Sport, and we haven't experienced any glitches or slow-down on the watches, while the microphone on the left of the case has had no problem picking up our voice (any problems here lie in the smarts of Google Assistant). Battery life will run for at least a day, a little over that if you're sparing with use. We haven't been caught short at all during the day after an overnight charge, which is something that would've happened on some older Wear watches. Right now the Grayson offers what's comparable with most other Android Wear watches, while the Apple Watch can usually last for two days – and the Samsung Gear S3 for three. While we're on the subject – and it's a small thing, the magnet on the charger has been strengthened to minimise slippage, so you're less likely to wake up and find you've actually got a dead watch in the morning. Believe it or not, that's happened a lot to us in the past. The Access Grayson makes some welcome improvements on last year's Dylan to better justify the high price of this smartwatch. The lack of Android Pay feels like a missed opportunity, but otherwise MK has done a good job of refining things, even if these watches will be too large for some. Among the fashion brands though, this feels like a pair of flagship Android Wear watches right now.